To help the public prepare for this year’s Nisei Week Japanese Festival Grand Parade (Aug. 10) and Ondo street dancing/Closing Ceremony (Aug. 17), free Ondo classes are being held from 6:45 to 9 p.m. on Thursday, July 17, Thursday, July 22, and Tuesday, July 29, on the Japanese American Cultural and Community Center (JACCC) Plaza, 244 S. San Pedro St. in Little Tokyo. The final practice on Thursday, July 31, will be held at Centenary United Methodist Church. Participants are asked to bring an uchiwa (round fan) and a naruko, a wooden clapper similar to kachi kachi but with a handle that is shaken. Additionally, a western line dance will be performed at the Closing Ceremony with one practice on Tuesday, Aug. 5, at 6:45 pm. at the JACCC. 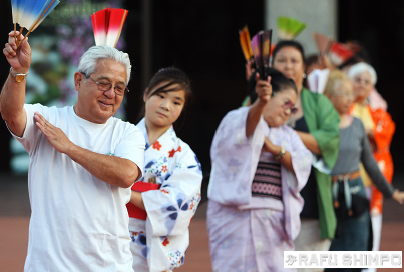 The Nisei Week Japanese Festival is a nine-day event first held in 1934, and is recognized today as one of the longest-running ethnic festivals in the United States. This event will take place in Little Tokyo from Aug. 9-17. For a calendar of events, log on to www.NiseiWeek.org or call the Nisei Week Foundation office at (213) 687-7193. The Nisei Week office is located at 244 S. San Pedro St., Suite 303, Los Angeles, CA 90012.